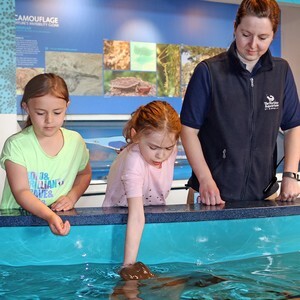 Watch and even help with the morning feedings of sharks, rays, terrapins and other marine creatures on Wed., April 17 in a special behind-the-scenes program in The Maritime Aquarium at Norwalk. “This program – called ‘Feeding Time’ – is offered by the Aquarium on occasional weekends, but this upcoming session is on a Wednesday as a fun and special experience in the middle of the school spring-break week,” said Aquarium spokesman Dave Sigworth. Cost is $40 for adults and $20 for ages 5-12 ($35 and $15 for Aquarium members). Aquarium admission at 10 a.m. is separate. Advance registration is required. Register online at www.maritimeaquarium.org/events.